Finding time to write lately has been a challenge. I usually leave the house early and get home late because of school. 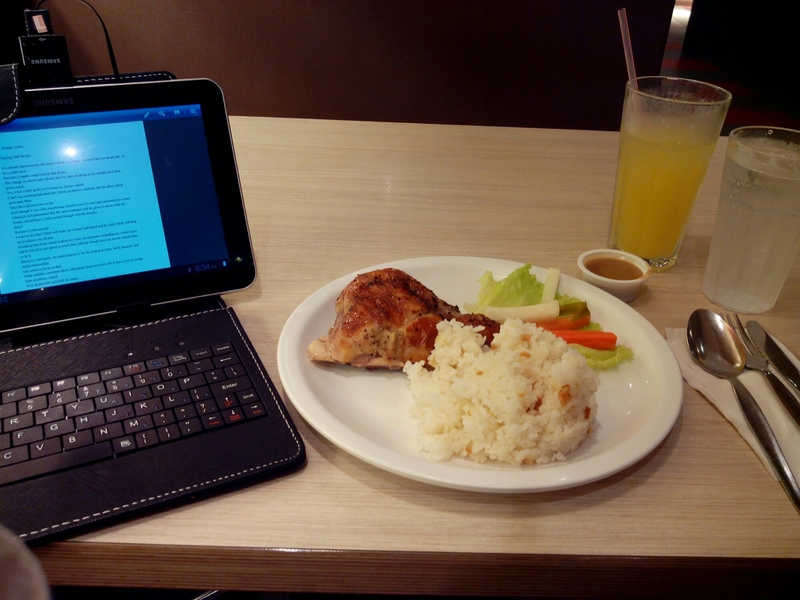 Luckily today, I arrived a little more than an hour before my class and because I wasn’t able to eat breakfast at home, I went straight to Kenny Rogers – a minute or two from the entrance of my school. I know it isn’t the healthiest out there but trust me, it is better than my breakfast for most days which usually consists of rice, fried egg, fried hotdog/spam, etc. Lately, I’ve been trying to fix my fitness routine and diet. Last Wednesday, I tried boxing for the first time. My sister and I arrived at around 8:30 in the morning at the gym (but started at around 9:00). Our training finished at around 12NN. Without the breaks, I think we trained for at least 1 hour and 45 minutes which by the way is a BIG leap for me cause I’m not really a fan of strenuous activities. I even hate jogging! —Our warm up was a 15 minute jog. The day after the trial session, my body was a bit sore. Yesterday (Monday), I had another boxing session. This time, it was my first training as an official member. I acquired a membership because aside from having discounts, I’d like it to be another pushing force for me to achieve my fitness goals. I’m not sure what the difference was (aside for the increase in intensity) but I felt like I liked the sport even more. But for some reason, I’d like the idea of me sweating because of working out. There is this unexplainable feeling of accomplishment after the training and I actually don’t feel bad eating lunch afterwards. Mind you, I didn’t binge eat! I think that aside from being a physical workout, boxing also is a form of disipline. Frankly, my right shoulder is a bit sore since yesterday. I think it is because of my wrong form when punching or because I exerted a little too much effort. Anyway, I know this will pass. The pain doesn’t bother me because I believe in the saying that soreness due to exercise is a reward and not a punishment. I plan to go boxing twice a week. I am slowly progressing and watching what I eat slowly. Trust me, it feels great afterwards! I guess you can tell by the title what this post will be about. And yes, it is not misleading. About my family in this case. As a family, I can say that we are close when we are together and a little not-so-close when not. I don’t mean literally okay! It is just that when we’re together, we converse well but we don’t spend so much time with each other as we do before so we have less bonding moments now. Usually when we get home, we go to our individual rooms and just go out again when it’s time to eat. Sometimes we eat together at our veranda, sometimes we eat inside our rooms. A family should eat together but I don’t know how it started but we don’t eat at our dining table anymore. When we are at the veranda, we use the foldable tables and monoblock chairs. It has been like that for a long time now. I woke up to a text this morning afternoon. Mom said that we should make house rules. Rules for eating, bonding and the like. My sister and I liked the idea. Not only will it bring back the family time we used to have but it will impose discipline as well. We plan to write down rules like eating together, 10PM curfew everyday unless you have a valid reason and things like family movie hours, studying time for the kids and also, a time for yourself. I shall show you a brief outline on our house rules when they’re done. Do you have house rules too?